In 2014, when everyone was talking about flagships of Samsung, Sony, Apple and HTC, one Chinese brand came and surprised everyone. Here we are talking about OnePlus. The all new brand ready to shine over the globe. It launched its first OnePlus One smartphone, already popular over the globe in no time. The OnePlus One is the flagship phone containing all the latest hardware and configuration. About the materials and build quality – everything is on the top five: high-quality materials used, and the assembly is done just fine – nothing anywhere sags and creaks. It uses a display matrix LTPS IPS, made by technology TOL – this is when there is no air gap between the glass and the sensor. The display has good viewing angles: In the event of large-angle vertically or horizontally a few drops contrast and color becomes grayish white. Cruising on the brightness – good, Automatic brightness adjustment works, in our opinion, the bad is the screen too much “dark”, under artificial light in adjusting periodically blows the roof – in general, it is better not to use it. Currently there is mention of the fact that, say, the black color in this display in some areas slightly yellow. The colors of the display are very good: soft, natural. In direct sunlight the display is very good: the image is quite discernible. In addition, here is a special mode settings improve readability in bright sunlight – it adds luminescence intensity. In the settings you have the option of switching the display by tapping on the screen – it is very, very comfortable. 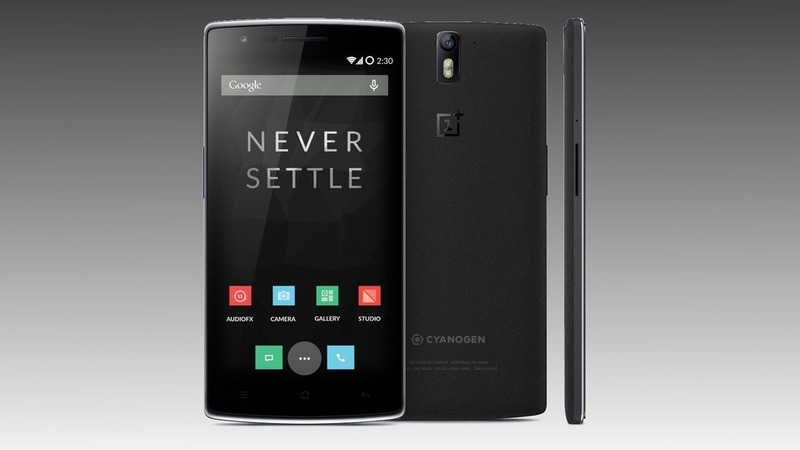 In the software end, OnePlus One has installed modified firmware CyanogenMod 11S coated Trebuchet 1.0 to Android 4.4.4. This is one of the most famous and popular firmware created by independent developers. It is characterized by a highly configurable. By default, there are only two desktops, but the new desktops are created with ease when you move the application icon to rightmost desktop. Lock screen, which can display a variety of additional information. Also, if you pull the screen to the left – the camera starts. In the version with 64 GB of on-board is available to the user about 55 GB – this is more than enough. In the settings you can select and edit the sets as well as the individual components of each topic. The default settings are only having two threads, but there is a separate application, “the shop”, where they presented a huge amount. Phone application works as expected: voice of the caller is heard in the dynamics very well and without distortion, the transmission of voice callers did not complain and noted the good noise reduction during conversations in noisy environments. The sound from the built-in speakers – loud and clear, but at full volume has been some overload: the dynamics begin to crackle. In built Keyboard – standard, android, miserable. It is better to change to something decent. Yes, OnePlus One is promising to be flagship with its performance, let’s wait if OnePlus is developing another beast for 2015 to compete with upcoming Sony Z5, LG G5 and Galaxy Note 5.